June 2017 is American Cancer Society Relay For Life month at Community Blood Center of the Ozarks! We’re focusing on each of our 10 non-profit LifePoints Lift partner agencies throughout the year, to help educate the public on the vital work that they each perform. When you donate blood at CBCO and sign up for our LifePoints rewards program, you’ll receive LifePoints as a “Thank you” gift each time you donate. When it’s time to redeem your LifePoints, you have the option of giving them to one of our ten LifePoints Lift partner agencies. CBCO converts them to cash and sends it to the non-profits. 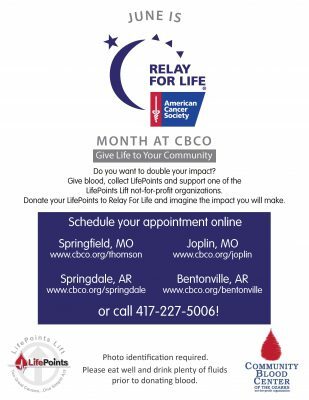 It’s a great way to help two non-profits at the same time — CBCO with your lifesaving gift of blood and American Cancer Society of Southwest Missouri with your LifePoints which allows the organization to work toward its mission to free the world from cancer. You’ll receive LifePoints for your donations all year round, and you can give your LifePoints to one of our agency partners at any time. Not just in June. But June is our time to share information about American Cancer Society – Relay For Life. To learn more about American Cancer Society – Southwest Missouri, click HERE. Founded in 1995, CBCO has grown to serve 40 counties in three states and is the sole supplier of blood and blood products to 40 hospitals in southwest Missouri, northwest Arkansas, and southeast Kansas (as of 6/2/17). More than 60,000 donations of blood are required each year to meet the transfusion needs of our friends and neighbors. We at CBCO take the responsibility of providing that blood very seriously. Our mission states that we will achieve this goal in a timely manner, at the lowest reasonable fee, while remaining accountable to the local community, blood donors and health care providers. With your help, we can accomplish this goal each and every day. To make your appointment to donate blood at CBCO, click HERE. If you’d like to sign in to your CBCO account to check your LifePoints balance or donate your LifePoints to one of our LifePoints Lift partner agencies, click HERE.